Today I have a first for me, but it's something I have always wanted to do in some way or another. 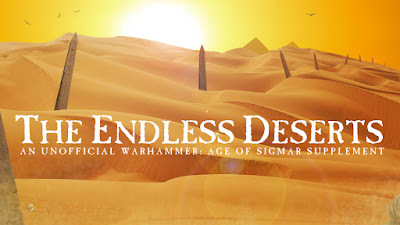 Since I am heavily inspired by AoS at the moment, but I'm also impatient for something official for my beloved Tomb Kings I took it upon myself, with the help of some feedback from select community members, to create a Time of War ruleset for the desert kings' domain. I have always been drawn to the narrative and campaign elements of Warhammer and Warhammer 40,000. Age of Sigmar is pretty much all about the narrative and the first two campaign books for the system have featured several rulesets called Time of War. For those of you who haven't read those book, Time of War rules are essentially an extra, and completely optional, set of rules that help bring the unique feeling and theme of the Mortal Realms into your games. For instance, the first book had a Time of War for the Brimstone Peninsula which featured stuff like blood geysers. These are just meant to enhance your games and really let you feel like you are fighting in a specific location instead of just a generic battleground. The other places they featured followed the narrative presented so mostly revolved around the Realm of Life and the Hanging Valleys in Chamon. These rule sets are just meant to be fun and flavorful and not at all competitive. With that in mind I set off scribbling down ideas I had for what fighting in the Tomb Kings domain in the Realm of Death would be like. I had a lot of fun coming up with some stuff and I think I captured the feel of the Tomb Kings pretty well. These rules also work great for any Death armies and of course can even be used in a game which features no Death forces at all. I also had a ton of fun trying to make this look as close to the official rule sets in appearance as possible. I really enjoy graphic design (I may even do it for a living...), so small challenges like this are always enjoyable. This is only the beginning though, as I already have plans for future installments in The Endless Deserts of Shyish, ranging from scenarios, to maps, to small bits of story. Depending on how well this is received I may expand into a further campaign pack, focusing on Orros Firestorm's Warrior Chamber as they attempt to reclaim the cursed city of Mireen (you can read my first seeds of narrative for that here), and even Time of War rulesets that bring to life battlefields from the World that Was. I personally think it would be pretty cool to refight battles from the War of the Beard or the End Times using AoS rules. You can find the two page PDF below, and you can also download it for free by opening it an in a new window. Please let me know if this is something that interests the community since I definitely had a ton of fun making it, and would love to know if the community has a much fun using it in thier games.